Imagine an office comedy...with creatures from Fantasy and Mythology. Can't? Not a problem; just read this first collection of comic strips from Hat Man Studios! 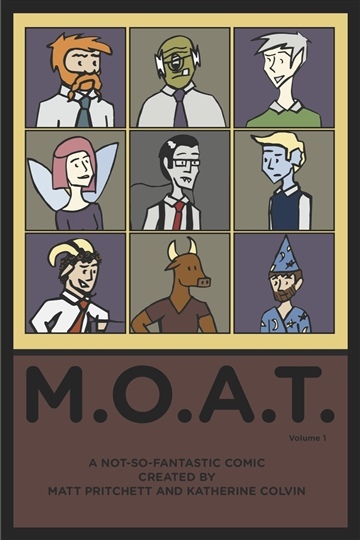 Elves, dwarves, merdudes, they're all there at M.O.A.T. Inc.! This is a pre-release of the first 19 comic strips form the wacky workplace that is M.O.A.T. More fun on the way! Follow us on Facebook and Twitter and check our website to stay up to date on M.O.A.T. and our other projects. While you're on Noisetrade, don't forget to check out our Noisetrade Music page! An art/writing double team from Hat Man Studios! Katherine is a student of design, currently exploring different areas of art and trying her hand at illustration. Matt is an experienced thinker who dabbles in scheming and has recently entered the foray of writing short stories and comics.